The client in this flood damaged hard drive recovery case sent us a two-drive RAID-1 array that had been submerged in floodwater during this year’s horrific flooding in Louisiana. RAID-1 is commonly used as a backup system, because both hard drives in the array are mirror images of each other. When one dies, the other can take its place and prevent data loss. But unfortunately, as a backup, RAID-1 has one weakness. This backup system breaks down completely when both hard drives are under several feet of water. Water and electronics don’t mix; water and hard disk drives especially so. If water collects inside a hard drive due to flooding, the platter need to be carefully and quickly cleaned and dried off in a Class-100 cleanroom environment in order for data recovery to be viable. Normally, the insides of a hard drive are, while not perfectly airtight, quite waterproof. The filter behind the drive’s breathing hole is very good at keeping liquid water out if a small amount gets splashed on the drive. But multiple feet of water are another story altogether. Water is incompressible, and if you have a lot of it, it’s very heavy as well. When multiple feet of water pressure push down on a hard drive, a little bit of that water has no choice but to push itself inside the drive. This is what often happens to hard drives in floods. There are a lot of components on both the inside and outside of a hard drive that will corrode if they get wet and then are exposed to air for too long. Hard drive platters in particular are especially vulnerable to corrosion. If floodwater manages to seep into the drive, dirt and mud carried by the water can become caked onto the platters, in addition to flakes of rust. Water will also ruin the lubricant on the platters, making it easier for the drive’s read/write heads to crash. To recover data from flood-damaged hard drives, our engineers need to carefully clean and dry off the platters and assess the level of damage done by corrosion. Corrosion requires three things: moisture, air, and time. The sooner our engineers get a waterlogged hard drive in our lab, the sooner we can address these three things before the platters become too damaged. Fortunately, the two hard drives in this RAID-1 array were spared the worst of the typical water damage we tend to see in flood damaged hard drive recovery cases. Once our cleanroom engineers cleaned and dried off the drives’ control boards and platters, our engineers could get them up and running again. This flood damaged hard drive recovery case ended up going remarkably well. The internals of the two hard drives in this RAID-1 array were in very good shape. As soon as the client had pulled the RAID-1 array from the floodwater, they contacted us here at Gillware to set up a case and overnight the drives to us. Because they acted quickly, we were able to clean off the drives and create disk images of them before corrosion could set in and ruin the platters. Our data recovery technicians were able to make forensic disk images of both drives and recover the vast majority of the client’s Quickbooks files. We rated this case a high 9 on our ten-point case rating scale. Not all flood damaged hard drives are so fortunate. A few months ago, our engineers saw a flood-damaged hard drive from another part of the country whose platter coatings had been ground to a fine powder because a computer repair technician had waited for the drive to dry out and tried to run it before sending it to us. Drying the drive out had given corrosion ample time to spread across the platters. 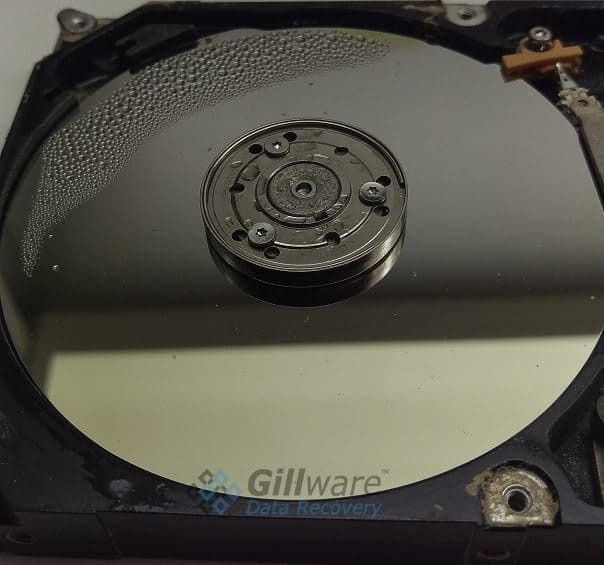 Running the hard drive in its condition had caused even further platter damage and made the client’s data completely unrecoverable, even by our highly skilled data recovery experts. The severity of a hard drive’s water damage can never fully be predicted, as well; sometimes the damage to a flood damaged hard drive will just be too severe, and there is nobody to blame but Mother Nature. If you need data recovered from a water damaged hard drive, the most important thing you can do is act quickly. Contact one of our recovery client advisers today to receive a free overnight UPS shipping label so that our data recovery professionals can evaluate and begin working on your hard drive immediately. We would rather receive a damp and dirty drive right away and have our professional electrical engineers clean it properly than receive one that has been left unattended to air-dry and potentially ruined. Our evaluations for data recovery are completely free, and we only bill our clients when we can recover their critical data at an acceptable price.